How Democracies Die is a 2018 book by Harvard University political scientists Steven Levitsky and Daniel Ziblatt about how elected leaders can gradually subvert the democratic process to increase their power. The book was on The New York Times Bestseller list. The book warns against the breakdown of "mutual toleration" and respect for the political legitimacy of the opposition. This toleration involves accepting the results of a free and fair election where the opposition has won, in contrast with advocacy for overthrow or spurious complaints about the election mechanism. The authors also assert the importance of respecting the opinions of those who come to legitimately different political opinions, in contrast to attacking the patriotism of any who disagree, or warning that if they come to power they will destroy the country. The authors point out that the various branches of government in a system with separation of powers have actions available to them that could completely undermine the other branches or the opposition. The authors warn against ramming through a political agenda or accumulating power by playing "constitutional hardball" with tactics like court packing, stonewalling nominations, or abusing the power of the purse, and recommend "forbearance" and some degree of cooperation to keep government functioning in a balanced fashion. Other threats to democratic stability cited by the authors include economic inequality and segregation of the political parties by race, religion, and geography. The authors dedicate many chapters to the study of the United States and the 2016 elections, but also apply their theory to Latin America or European countries. According to them, the United States has, until 2016, resisted the attempts to undermine democracy thanks to two norms: mutual toleration and forbearance, the latest defined as the intentional restraint of one's power to respect the spirit of the law if not its letters. They finally predict three potential scenarios for the post-Trump United States. The New York Times called it an essential guide to what can happen in the United States. The Washington Post said the book offers a sober look at the current state of affairs. The Wall Street Journal called it an unintentional clarifying lesson. In the United Kingdom, The Guardian called it provocative but also unsatisfying. The magazine Foreign Affairs concluded it is an important study. Fair Observer called it an original contribution valuable to researchers, policy makers, and citizens. The book was awarded with the German NDR Kultur Sachbuchpreis 2018. ^ Levitsky & Ziblatt 2018. ^ "How democracies die". Retrieved 29 April 2018. ^ Kristof, Nicholas. "Trump's Threat to Democracy". The New York Times. Archived from the original on 29 April 2018. Retrieved 29 April 2018. ^ "Can American democracy withstand its latest assault?". 11 January 2018. ^ Willick, Jason (24 January 2018). "Review: Polarized Societies and 'How Democracies Die'". ^ Runciman, David (24 January 2018). "How Democracies Die review – Trump and the shredding of norms". The Guardian. Retrieved 29 April 2018. ^ Kolasa, Matthew (August 15, 2018). "How Democracies Die Around the World". Fair Observer. Retrieved August 16, 2018. ^ "Levitsky und Ziblatt erhalten Sachbuchpreis 2018". NPR.de (in German). November 12, 2018. Retrieved December 16, 2018. Ikenberry, G. John (2018). 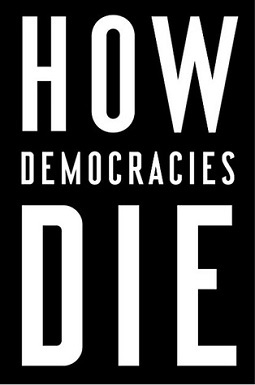 "How democracies die" (March/April). Levitsky, Steven; Ziblatt, Daniel (2018). How Democracies Die. New York: Crown. ISBN 978-1524762933.